New Delhi, Nov 19: Indian Director General of Military Operations (DGMO) Lt. Gen. A.K. Bhatt on Saturday told his Pakistani counterpart there appeared to be a disconnect between the intent of the Pakistan Army headquarters and the troops. In an unscheduled hotline talk requested by Pakistan, its DGMO Maj. Gen. Sahir Shamshad Mirza alleged that Indian security forces have resorted to unprovoked firing and targeted civilians opposite Poonch sector. 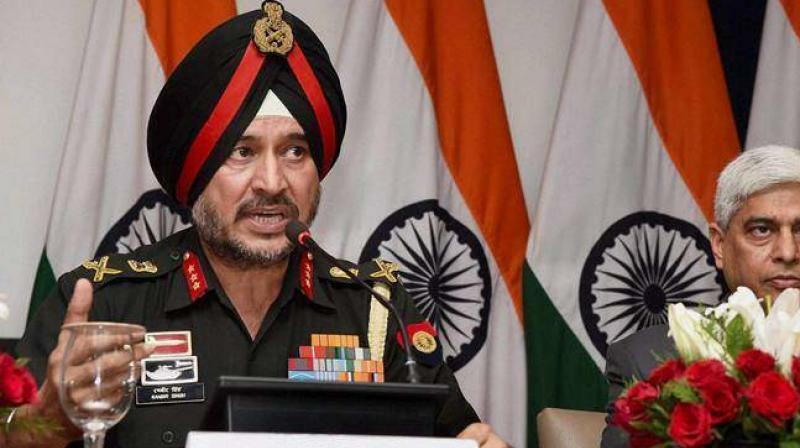 Lt. Gen. Bhat said retaliatory firing by Indian troops has only been carried out in response to unprovoked and repeated cease fire violation from Pakistan's side. Bhatt impressed upon the Pak DGMO that there appeared to be a disconnect between the intent at the Pak GHQ (general headquarters of Army) which reiterates its desire for peace and the actions of Pakistani troops along the Line of Control (LoC), who resorts to heavy firing without provocation, an official statement said. He further exhorted the Pakistan DGMO to resolve this existent credibility gap to ensure that peace and tranquillity is maintained along the Line of Control. The DGMO further clarified that the Indian Army always maintains impeccable standards of professionalism and does not target civilians in any manner. "Indian Army will continue its effort to ensure peace and tranquility on the borders. However, Indian Army troops will continue to take all retaliatory measures and retain the right to punitively respond to any provocative acts of aggression from Pakistan side," the Indian DGMO said.